GPS - Parking area, 745m el. GPS - Ramona Falls, 1.08km el. 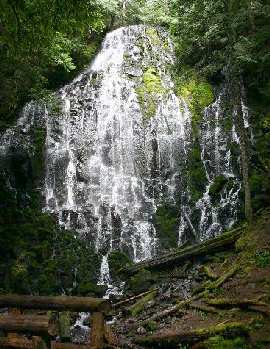 Ramona Falls is on the western flank of Mt. Hood. At milepost 42 in Zigzag turn left onto E. Lolo Pass Road. After 4 miles look for a Y intersection. Turn right onto road 1825. After 0.7 miles bear right at another Y intersection over a bridge. In a half mile bear left onto Ramona Falls Trail #727. After nearly a mile take the left fork for Ramona Falls (Lost Creek Falls to the right). One half mile leads to a very large parking area with chemical toilets. (late spring thru October) aids in the crossing. (you could take the trail straight up at the map, but it has more rise and fall in elevation).